National Corduroy Day – What is it and what does it mean? 11.11 is a significant day across the world for many different reasons. For some, it resembles a simple binary code. In Malaysia, couples choose to get married on this day as it is believed they will receive good marital fortune. Others think the date is connected to the Mayan Apocalypse. Perhaps the most significant reason is that the 11th November is Armistice day as millions of people across the world fall silent at 11 am on this date every year to remember the fallen from the 1st World War. For a small selection of the population, the date means something completely different. The Corduroy Appreciation Society adopted this day as National Corduroy Day back in 2005 as the pattern of the date 11.11 closely resembles the design of corduroy. On this day members celebrate all across the world by donning two or three of their favourite corduroy items. 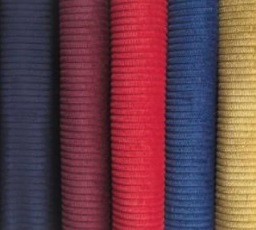 Where does the word ‘corduroy’ originate from? While we are discussing Corduroy Day, let’s take a look at how ‘corduroy’ came to be. Some say it is from 17th-century France and comes from the phrase ‘corde du roi’ or ‘the king’s cloth’. Another suggestion is that it originates from the 13th century and the city of Manchester. Wherever it originates from there is no doubt that corduroy trousers have become a staple item of the discerning gentlemen’s wardrobe. The colours have got brighter, the fabrics more diverse and the huge selection now available means that there is something for everyone in ready to wear, custom and made to measure options. In fact, check out our new range of colours. If you love your colours bold and bright, then we have a real treat for you. If you prefer something a little less eye catching then we cater for everyone. Free Delivery This Weekend Only! 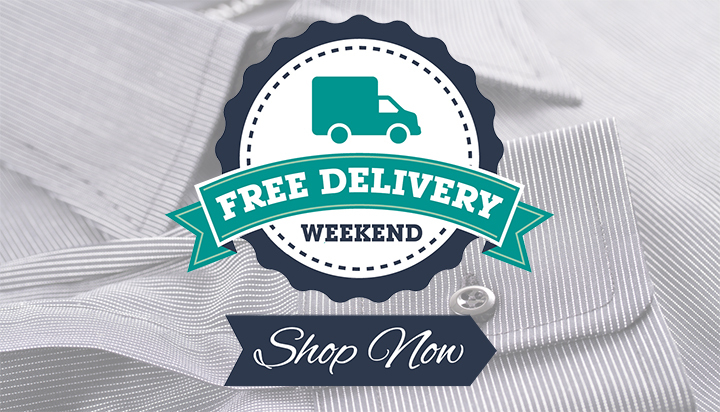 We are delighted to announce that we are offering FREE DELIVERY across our entire clothing range for this weekend only. Now is a great time to stock up on summer clothing like shorts and polo shirts or to replenish those wardrobe essentials, like made to measure jeans and trousers. No need to enter a code, we’ll apply free delivery to your order, so whatever you want, order now* and you’ll benefit from absolutely free delivery! *Free delivery promotion starts at 12pm GMT Friday 11th July 2014 and ends 5pm GMT Monday 14th. Offer applies to UK delivery addresses only – international delivery rates still apply for customers outside the UK. Any orders placed before or after this period will not be eligible for free delivery. We are delighted to announce the launch of our brand new website. Great New Look. Great New Features! Not only does the website now look great, but it’s much easier to use, there are more products than ever and there are lots of great new features too! We love our new look and hope you do too. 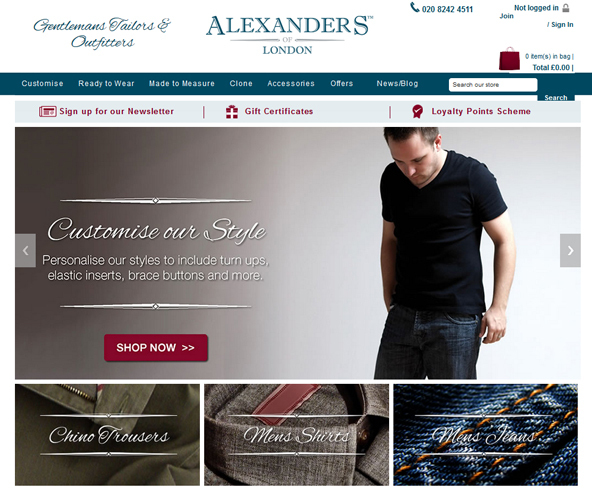 See the new Alexanders of London website here. Did you know, you can also follow us on Twitter, Facebook, Pinterest and Google+ alternatively, you can be kept up to date with all of our latest news and offers by signing up to our newsletter here. Test Fit Garments Now Available! We are delighted to announce the introduction of a brand new service, now offered across our men’s customised trouser range. 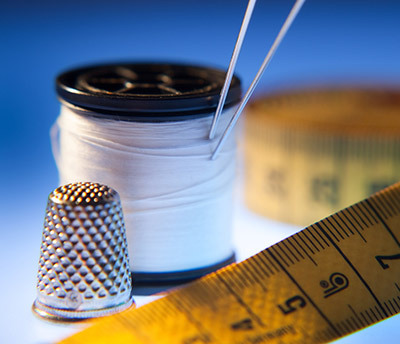 To ensure the perfect fit, you can now order a test fit garment. This will be made out of pocket lining fabric, and doesn’t include any trimmings or accessories, but is ideal for trying on and will give you an accurate idea of fit. Our test garments are available for a nominal charge and can be selected by ticking the appropriate check box in the product options section. You get to try on (and keep) the test garment before we start production on your customised order. This will allow you to assess whether you need to order an alternate size to the one originally ordered. This is particularly useful if you are a new customer to us, aren’t sure the measurements you’ve taken are accurate or simply want additional peace of mind before production of your order is started. Browse our men’s custom trouser range here. One of the big trends to look out for this year in terms of menswear, comes hot from the catwalk. Of course not everything that the big designers show of in Paris, Milan and London survives outside of the catwalk, but there is one trend that looks set to be hot on the high street this summer, and that’s florals. Is floral print too feminine? Gender stereotypes limit creative vision, and trust me when I say that a shirt adorned with flowers, looks much better than a shirt covered in spanners, rugby balls, car engines or indeed any other similar overtly male-associated imagery! 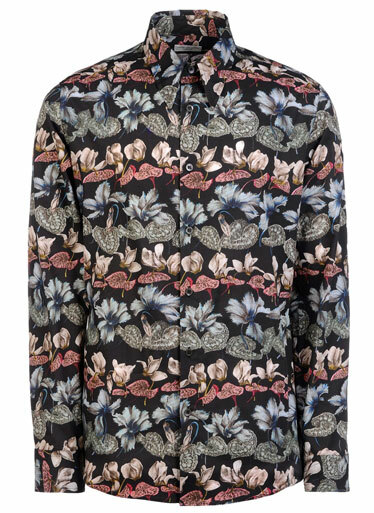 Whilst floral prints may be a push too far for the average man, who really want’s to be an average man? Some men feel that floral patterns are too loud, others may feel they are too girly, but rest assured, this summer is going to be heralding in the trend for bold florals. Think of a classic Hawaiian shirt, then imagine one designed with more taste and you’re there. When people think of florals, they tend to immediately think of pinks, pastels or bright hues that men might instinctively shy away from, but there are some great ways to get in on the floral trend, without needing to step too far out of your comfort zone. Floral doesn’t have to be bright and garish and there are some great examples of shirts featuring super subtle flower designs in understated hues. The key thing to remember when you go floral, particularly if you choose a floral shirt, is to choose a matching or contrasting coloured plain trouser to pair with it. We’ve got a great selection of slim leg, flat fronted trousers that will compliment any floral shirt, check out our range here. Gentlemen – its time to take a brave step towards individualism! Thinking of going floral? 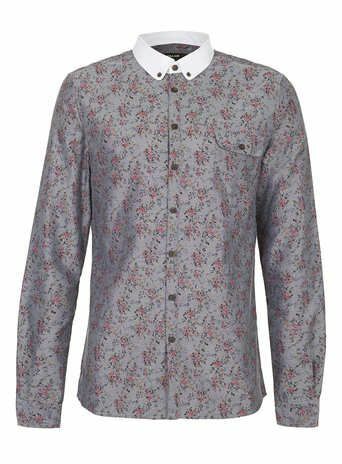 Head on over to our Pinterest board to see are our pick of some of the best floral menswear pieces available online and on the high street. Flash Sale Now On – 20% Off Everything! We are delighted to announce news of a flash sale that is now on, giving you a discount of 20% off all of our products. During our flash sale, you’ll get a fantastic 20% off everything from our entire range and you don’t even have to enter a pesky voucher code, we’ll automatically apply the 20% discount for you at the checkout. Don’t miss out on this brilliant opportunity to save, but make sure you place your order before Thursday 20th February, as the offer ends at 12 noon. When it comes to jeans, almost everyone has at least one pair in their wardrobe and for many of us, they are the casual trouser of choice. In this article, i’ll be exploring the origin of jeans, discussing their rise in popularity and will finish by looking at the various options currently available to buy. 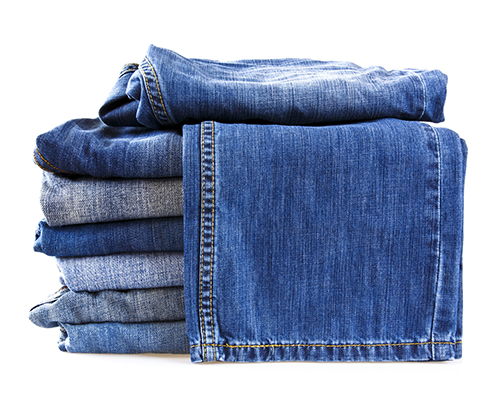 Jeans were first designed as practical, hard wearing workwear for labourers working in mines. Also popular with farmers, jeans were the brainchild of a U.S. tailor called Jacob Davis, who first had the idea to reinforce jeans using rivets, a move the proved extremely popular thanks to the added durability that they provided. Unable to finance a patent to protect his invention, Jacob Davis contacted his fabric supplier for help. Who was that supplier? Levi Strauss. The newly patented trousers became known as Levi’s and were initially made in two different fabrics, a canvas-like cotton duck and in denim. In the 1950’s when movie stars took to wearing jeans, they were given a cool image that the masses rushed to copy. Slowly jeans began to be less associated with workwear and more associated with what was hip and cool. No matter where you stand on the issues, love them or loathe them, there is no denying that the popularity of jeans endures, and with a multitude of different styles and colours to choose from, there are more options available than ever, making it easy to find a jean that fits your individual style. The quality, styling and fit of a pair of denim jeans varies massively. From budget supermarket jeans costing a few pounds, right through to designer and tailor made jeans costing many hundreds of pounds. But is an expensive pair of jeans really worth it? The Guinness Book of Records lists Escada’s Couture Swarovski Crystal Jeans at £5,800 as the worlds most expensive jeans. Cheap jeans as a rule will always fall short in terms of quality – a much thinner denim fabric may be used, or indeed a thin cotton, simply finished to resemble a true denim jean. Thinner fabric means less durability which will in turn mean they need to be replaced sooner. Another telltale sign of cheaper jeans is the quality of stitching, seams will be flimsy and the stitching will be minimum, making it more likely that seams will split. Another big difference tends to be in terms of cut, as cheap jeans are cut to appeal and to fit the widest possible audience, they will often be cut from a forgiving (often quite shapeless) pattern designed to fit as many different figures as possible. As a result, cheap jeans often fit badly, though this is not always the case, and we’ve certainly seen some decent examples for under £25. Buying jeans on the high street is one thing, but buying jeans online makes it difficult to know what kind of fit your getting and how that fit will translate to you when you actually put them on and wear them! For this reason, I believe that the easiest way to buy jeans that fit well online, is to go for made to measure jeans. For the best fitting jeans it make sense to pay for quality, but that doesn’t mean you have to go with a designer brand or high street label, and it certainly doesn’t mean that you have to pay a fortune! Made to measure jeans are an excellent way to ensure your online purchase is the perfect fit when it arrives. Alexanders of London have beautiful made to measure denim jeans starting at just £40. That means you get a jean bespoke to you, that will fit perfectly and look stunning. Take a look at the men’s made to measure jeans that Alexanders of London have available on their website here. We are delighted to have launched our brand new blog, and over the coming months we hope you’ll enjoy reading our articles. We’ll be writing about a range of different topics, in particular men’s lifestyle and classic fashion. We’ll also be letting you know about our latest products, and providing you with handy guides to help you get the most out of your wardrobe. If there are any particular topics that you would like to see us cover, then do please let us know as we’d be delighted to hear your thoughts and suggestions.